Installing a wood stove the wrong way can mean the difference between life and death. Most states, including New York, require a permit to install a wood stove. Before installation, get an understanding of code regulations, which outline everything from what building materials to use, to a stove's required distance from the wall. 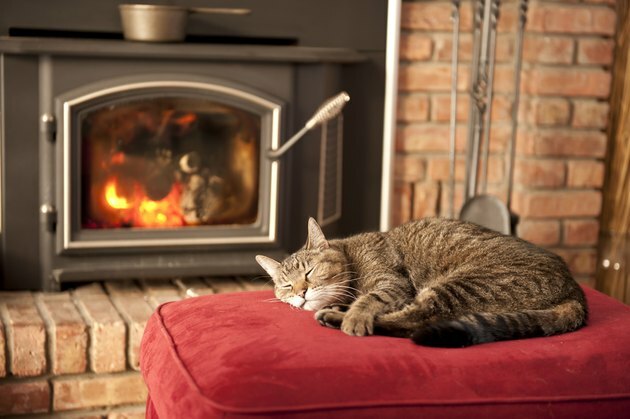 Make sure the wood stove you purchase is right for your heating needs. If it's too small, you may run it hotter to get the desired heat you want, but consistent overfiring will damage the stove and its parts and cause an exhaust issue or fire. Conversely, if the stove is too large and it's frequently underfired, a buildup of creosote can raise the temperature in the stove's pipe and also increase the danger of exhaust problems or fire. Before purchasing, check carefully for deterioration or damage in the wood stove or its parts and avoid buying a unit built before 1990. That was the year the Environmental Protection Agency enacted its Phase II emission standards, and older stoves may not be compliant. According to New York State regulations, "fuel-burning appliances shall be vented to the outdoors" following the manufacturer's instructions, unless the stove comes unvented. The pipe used for a wood burning stove must be resized to control gas condensation in its interior and provide adequate draft. It must be unobstructed and free of combustible deposits while in use and without any cracks, gaps or perforations. Any damage to the pipe could allow harmful gasses to escape inside the home or cause a fire. Also, while being used for a wood stove, the pipe should not vent any other appliance. When installing a stove pipe, take the shortest route possible from the stove to the outdoors to improve draft and reduce turbulent exhaust gases. The longer the pipe, the more likely that its joints will deteriorate over time. Also, limit sharp bends in your stove pipe and allow for gradual curving. To secure stove and the pipe, make sure the floor underneath the unit can hold its weight. If the floor is sturdy, buy or build a hearth to place the stove on and make sure it consists of non-combustible material. The hearth must extend under the entire unit once the stove is on it. It should cover 12 inches past the sides of the unit and 18 inches past the front of the stove's loading doors. Single-wall flue pipe clearance must be a minimum of 18 inches from the wall or any additional combustible materials around the stove. If the stove pipe has a double wall with a stainless steel interior and black exterior, a minimum clearance of 6 inches is allowable. If you're installing a wood stove or a stove pipe yourself and have questions about these regulations, be sure to check with a New York State building inspector and the retailer of the unit to make sure you're in compliance.